Posted: Tuesday 30th April 2013 in Performance Marketing, Thought Leadership. Last week as one funeral made the headlines another was already in the pipeline. Last week Google announced their intention to close their affiliate network to focus on its PLA service and its host of other acquisition tools. 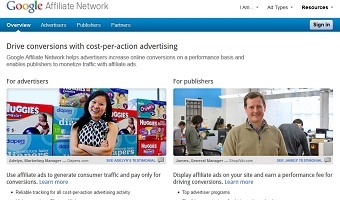 Launched in the UK in early 2012, after Google’s re-branding of the Doubleclick ad network, it was pitting itself against the current front runners in the affiliate network space, Tradedoubler, Affiliate Window and Commission Junction. We asked Tradedoublers’ agency director, Dave Ayre, if he was surprised by the announcement and if he thought it would have any impact on the affiliate channel from their point of view? “After such a short time within the industry, it is always disappointing to see a company struggle to get their return. However, it does validate that the affiliate industry isn’t the easiest industry to work in. Networks have worked hard over a number of years to build up their technology primarily, but also their relationships. Affiliate marketing is about more than just technology. The issue with Google Affiliate Network is that it relied heavily on a self-service platform. To be successful, networks need long standing relationships and advertiser and publisher confidence. Even though the UK is in recession, decisions from advertisers on their affiliate marketing are not solely cost based. The one thing that the retailers will be asking themselves is where do we go from here? The answer is not to panic. I think it is fair to say the Affiliate Windows and Tradedoublers of this world will already have their eye on the retailers they would like to add to their ever swelling list of clients, with the likes of Netflix and Ocado up for grabs. An important thing that all the GAN retailers should be considering is, what do we need from our affiliate network? The answer to that question is not as simple as it once was. Gone are the days of a basic tracking solution for a channel that was regarded as a poor relation, now the affiliate channel is as important as ever in the booming age of multi-channel marketing. Collect all your data from the network it will be important to keep for future reference. Consult your top performing affiliates and ask if they have a network preference. Source a new affiliate platform or consolidate an existing programme. As the former Prime Minister said “the lady is not for turning” but in an ever evolving marketplace turning and change is integral to keep up with your competitors.